Interloop™ works with industry standard two-wire, partyline intercoms, connecting to the existing intercom system like any other belt pack. 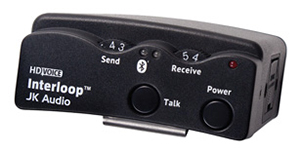 Using Bluetooth Wireless Technology*, Interloop™ allows wireless connection to a variety of audio devices. A rear panel switch selects Headset or Phone connection. Headset mode allows you to connect to a Bluetooth enabled headset for wireless freedom. Phone mode allows you to connect to a wireless phone to let others join in, or connect to a notebook or laptop to provide remote voice access using communications applications such as Skype™. Powered by the intercom system, yet uses less current than a typical belt pack. Includes 9 VDC battery backup, holding the wireless connection while changing cables. Can I connect a wired headset directly to the Interloop? No, Interloop provides only a wireless connection. Please ask if you would like us to include any headsets with your order. Why does Interloop need a 9V battery if my system provides power? The optional 9 volt battery keeps the wireless connection intact while intercom power is disconnected. A fresh 9 volt alkaline battery can keep the connection running for up to 10 hours without system power. When system power returns, it automatically overrides the 9 volt battery. What is the procedure for switching between headset and phone connections? Interloop must be powered down and restarted between role changes: 1) Turn off the power switch 2) Change the Role Switch 3) Turn on the power switch and either pair or connect to the new device. Does Interloop work in "ClearCom" mode or "RTS" mode? An internal switch selects between connecting audio to Pin 3 (default) or Pin 2 (audio + power). How do I choose which audio channel I will use? Simply remove the two screws that hold the battery drawer in place, and carefully slide out the battery drawer just enough to allow access to the inside of the enclosure. Locate the small slide switch and select either channel 1 or channel 2. Replace the battery drawer and reinstall the mounting screws. Does Interloop work with balanced intercom systems? No, Interloop only works with unbalanced 3 wire intercom systems.